This cam focuses on peregrine falcons nesting on a SunTrust Plaza Tower balcony more than 50 stories above Atlanta. Nesting typically occurs February–May. Unfortunately, the peregrines have not nested on the balconies since 2016, although sightings of juvenile peregrines in the area suggest they have nested in or near the building. 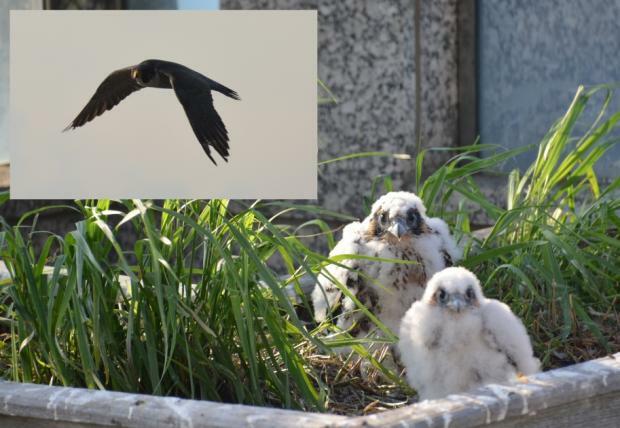 DNR and partners hope the peregrines return to their usual SunTrust nest sites in 2019. The state's only known "wild" nest site is at Tallulah Gorge State Park. Explore DNR efforts to conserve birds and other wildlife in the Wildlife Conservation Section's annual report. Buy or renew a wildlife license plate. Contribute online or directly to wildlife conservation. Donate to the Georgia Natural Resources Foundation. This cam focuses on peregrine falcons nesting on a SunTrust Plaza Tower balcony more than 50 stories above Atlanta.